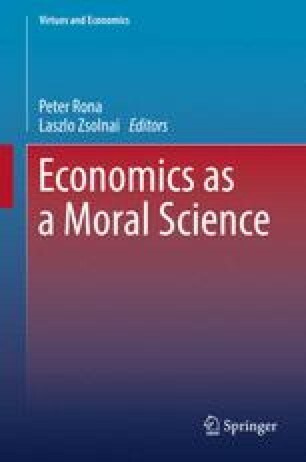 This chapter summarizes the main issues and themes of the book and shows its contributions to the development of moral economics. Zamagni suggests that we can harness market interactions by re-defining the market in a non-individualistic way, as a network of mutually beneficial relations, along the lines suggested by the civil economy paradigm. Bouckaert underlines that thinking of economics as a relational dynamic opens a space for human creativity without losing the embeddedness in a system of meaning and purpose. Following Amartya Sen economic reason can be understood as reasonableness of preferences, choices and actions. Zsolnai argues that reason requires that economic activities are achieved in ecological, future-respecting and pro-social ways. But Peter Rona warns that the corporation was born as the device for severing the unity between the act and responsibility. He concludes that positivist economic theory, when combined with the function performed by the corporate veil destroys the unity between the action, the actor and the moral responsibility for the action with the result that the corporation must do without the basis for a morally authentic life. Helen Alford suggests that economics needs to be more reflective about its underlying ideas. Whereas the tradition of jurisprudence is well established in the legal field, economics has no equivalent tradition of self reflection.